Stock stamps are an excellent choice for business and personal use. We have a wide range available. 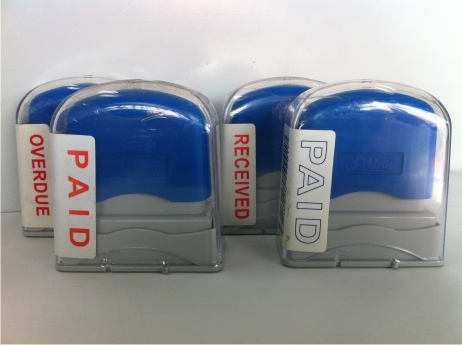 Some of the Stock Stamps are available in Red or Blue ink. The majority of Stamps are supplied with red ink only. Not Negotiable, Paid, Entered just a few of the range available. The Stamps can be re-inked when the impression starts to fade. To re-ink your Stamps pull the handle off and add few drops of ink in to the cartridge under the handle. Only a few drops of ink are required and it is recommended that you re-ink the stamp before you go home for the day so that the ink can settle over night in to the pad. Try to stamp in the morning and if it needs more ink add a few more drops.